L-R: Alex Walker, Dr. Graeme Connolly, and Gina Zagarella. AUGUSTA, GA. – Enrollment in the Department of Kinesiology has exceeded previous levels, according to Chair Steven Page. He reports that 315 students have joined the Bachelor of Science in Kinesiology and the Bachelor of Education in Health & Physical Education programs. Wellness and Activity classes are also at maximum capacity, and the department will offer its first activity class on the Health Sciences campus this Spring. Yoga was a hit this semester among students, who maxed out enrollment so quickly that the department is considering offering a second class in the Spring. And a new Wellness class, Sports Officiating, will be offered in the Spring. Zachary Wright, head of Intramural Sports, will teach the class. The course is expected to assist in growing the Intramural Sports program. 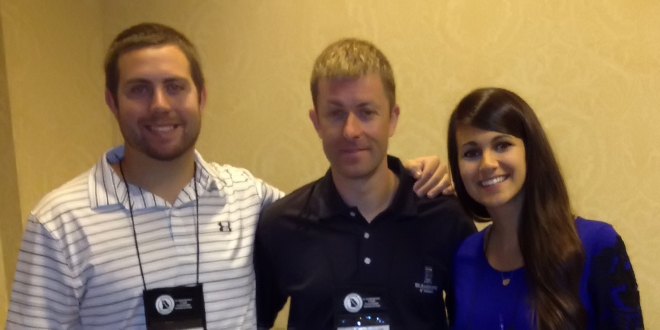 Dr. Graeme Connolly and students Alex Walker and Gina Zagarella presented twice at the annual recent Georgia Association for Physical Education, Recreation, and Dance convention on Oct. 28 in Atlanta. The three presented a lecture titled “Lessons learned from elite coaches: recommendations to improve your coaching practice,” and an activity session called “Improving fitness IQ with health-related fitness activities.” Two other students – Kay Pounds and Courtney Sumner – also attended the conference. Kinesiology has been hosting Professor Zhu Congqing from Shanghai Normal University this semester. He has been observing classes in the department and also observing the GRU Men’s Basketball team. His research interests are Physical Education Instruction and how basketball is coached at the university level.